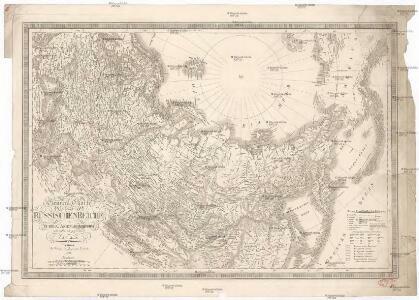 Russie d'Asie et des regions polaires boreales. The European part of the Russian Empire. The Asiatic Part of the Russian Empire. 1 : 18700000 Migeon, J. Union of Soviet Socialist Republics. Pergamon World Atlas. Das russische Reich nach seiner allmaehligen Vergrosserung. Union of Soviet Socialist Republics (USSR). 1 : 13994000 Hammond, C.S. Das Russische Reich nach seinen ethnographischen. 1 : 20000000 Rusko východní Kuzbass, A. Composite: Carte Generale de la Russie d'Asie ou Siberie. 1 : 14300000 Vivien de St Martin, L.
Russian Empire, in Europe and Asia. The Russian Empire, in Europe and Asia.